SE0042 6317. 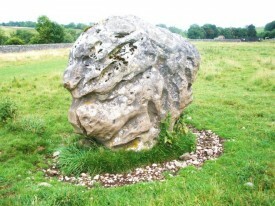 Standing in a field just opposite St Michael & All Angels church at Linton near Grassington is a 6 foot high boulder. The limestone boulder is round-shaped and covered in large holes or pockmarks along with grooves caused by erosion over thousands of years. In the same field there are other recumbant stones though these are much smaller in size. And built into a wall not far from the banks of the river Wharfe, there are three smaller limestone boulders. The largest of these is obviously a glacial erratic that was deposited here by the retreating ice flows some 11,000-13,000 years ago at the last Ice-Age. It could be that the boulder and whats left of these other stones originally formed a pagan stone circle; these stones being moved in to position in prehistoric times by a tribe of ancient people living beside the river. The boulder and the other scattered stones form an alignment, but many have been robbed away by local farmers. Near the entrance to St Michael’s church on church road stands the stump of an Anglo-Saxon cross which means the site was Christianised at some point between the 7th-9th century AD. Categories: Glacial Erratic, Linton-in-Craven, The Linton Stone | Tags: The Linton Stone at Linton-In-Craven in North Yorkshire | Permalink.